We received a letter from our Compassion International friend in Ecuador! This was certainly a highlight to our week! On the other side of her drawing she told us a little about herself and her family and how thankful she is to have us sponsor her. It was a sweet read. We love helping make her life a little better and having a pen pal, too. This week was also full of activities. Caraline's reward for completing her Awana handbook, Destination Unknown, took place this week. 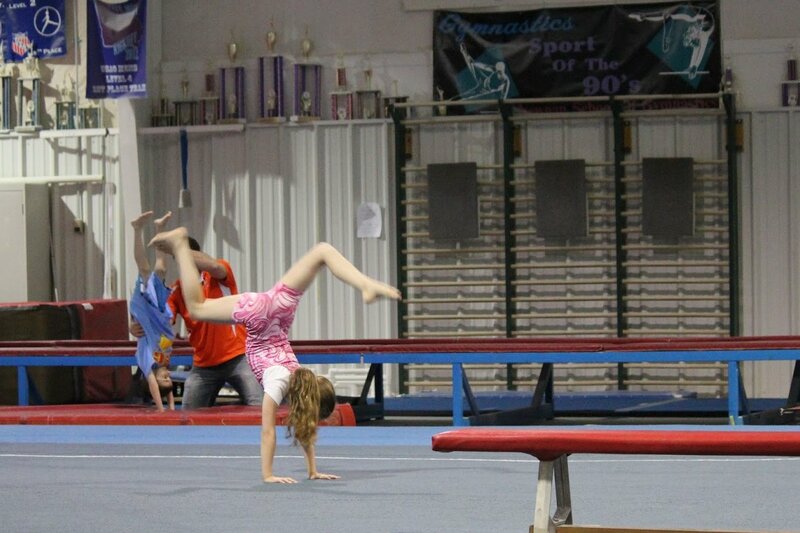 She completed her first standardized test, and she and Ryan participated in their annual gymnastics performance. This will be their fourth gymnastics show! We were so proud of our little ones! Caraline is a natural in front of a crowd. She doesn't get nervous at all. Ryan on the other hand, was not eagerly anticipating the performance. In fact, he didn't want to go. Daddy had a very good talk with him a few hours before the show, and Ryan's attitude changed to being excited!! One of the many things Daddy told Ryan was to keep repeating "Heart of a lion, heart of a lion..." when he would become nervous. Ryan later told us he kept repeating that phrase to himself when it was his turn and it helped him to be very brave. 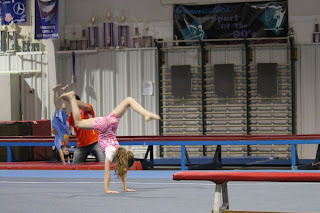 Here are a couple of pictures from their gymnastics performance. Caraline's Destination Unknown was a big treat! She had so much fun meeting new friends (she was the only third grade girl to complete their handbook) and finding out just what in the world she would be doing and going for Destination Unknown. The destination was kept super secret. The kids paired off into groups of four on golf carts and went on a huge, three hour scavenger hunt around a beautiful part of the city's golf cart paths. Caraline LOVED it!! The group of 20 or so kids and chaperones came back to the church for a meal (I helped out with this part.) and fun games that can only be done in a gym. They played Shipwrecked, Human Foosball, a game where you kick off your shoes and try to ring a plastic bin- I forget what it's called and a few more fun games. Caraline had the best time and she can't wait for next year's Destination Unknown, which will be different!! I am so thankful to have wonderful Awana leaders that love these little ones and work so hard to make Awana and Destination Unknown so much fun and so good for their hearts! Afterwards, she drew this cute picture she titled, Shootin' Sunshine. She's been reading an American Girl History Mystery, Danger at the Wild West Show. Caraline and I tolerated the ITBS this week. It's mandatory in our state to test every three years beginning in third grade. I know exactly where my children stand in each academic area because I teach them. As they get older and are working more independently, maybe the tests will be of some value to me - but from the questions I saw on the third grade test - I'm not a big fan. Our rescue dog, Sandy, scooted her way in between Ryan and Caraline as we were reciting our math facts. I must admit, having your dog sit in on an outside math class is FUN! Just like our bluebirds' mom and dad, our titmice parents are working hard taking food back and forth to the nest and keeping it clean. It's a joy to observe! I'm still loving my Bible study of James by Beth Moore. I finished reading Not a Fan (Wow! Is all I can say.) and began Multiply by Francis Chan. I read Crazy Love last year by Mr. Chan, and it is fabulous. Really makes you think. Here's one of my favorite videos that one of our pastors shared a few months ago. (The first minute he talks about his childhood. It's rough. Might want to listen without the little ones nearby.) His balance beam routine goes along beautifully with our gymnastics theme. This week I am linking up with our friends at Homegrown Learners' Collage Friday.